Nintendo legend Shigeru Miyamoto admits that Nintendo has been working on new hardware, but the father of Mario is keeping quiet on everything else. Here's a question: What do you do if you have Nintendo guru Shigeru Miyamoto with you in a closed-door session in London? What do you ask the man who could well be described as the father of modern gaming? If you're a games journalist, you'd probably ask him about Project Cafe, the rumored new Nintendo console scheduled for an E3 debut. In fact, that's exactly what happened, according to Next-Gen.biz, but Miyamoto hasn't been in the industry for decades without learning how to deflect a question or two. "Don't ask!" he said. "Even when the Wii launched we were developing new hardware, work on 3DS had already started. It's a matter of when we announce it." When pressed on whether the right time to announce it would be this year's E3 as scheduled, Miyamoto politely declined: "Please wait. Be patient until we decide." So there you go. Nintendo is definitely working on new hardware, and has been for some time, but anything else - including rumored Project Cafe specs and designs are complete rumor and speculation. 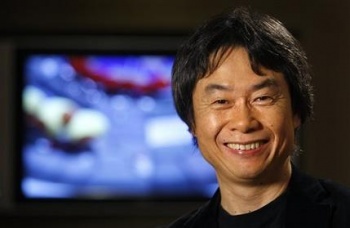 Also, Shigeru Miyamoto must roll superb Reflex saves when he plays D&D.